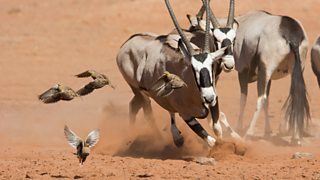 BBC One - Planet Earth II, Deserts, In pictures... - Sand grouse quickly take to the wing to get out of the way of these fighting oryx. The incredible ways in which animals cope with living in the planet's deserts. Sand grouse quickly take to the wing to get out of the way of these fighting oryx. 4/6 The incredible ways in which animals cope with living in the planet's deserts.